Help Central Piedmont Food Pantries Win $10,000! Did you know 44 percent of Central Piedmont students reported they are food insecure? Did know that there are more than 527,000 people in our region living at or below the poverty line? Did you know that more than 188,000 are children at risk of going hungry every day? Your donation helps us work toward winning $10,000 for CPCC’s Emergency Food Pantries by November 16, 2018. Since Central Piedmont opened the doors to our Emergency food pantries, we have fed more than 2,376 students, faculty, staff and their families. Bring non-perishable food items donate. Barrels will be at all campuses the week of 10/29/18 or drop them with your Service-Learning staff at your campus! Help us support Second Harvest Food Bank of Metrolina and the Food Lion Feeds Collegiate Challenge and our hungry neighbors by making a donation TODAY. The process is fast, easy, and secure. We truly appreciate any support you can provide. It will benefit a great cause! Funds are Second Harvest & Food Lion Feeds greatest need and a wonderful way to multiply your giving. In the big picture, they are able to provide 7 pounds of food into the community for every $1 donation! Funds help keep refrigerated trucks on the road allowing them to pick-up and distribute fresh produce, dairy and meats to more than 700 partner agencies. The Food Bank can also purchase products by the pallet – securing much needed items at great pricing. In short, funds result in critical and healthy foods reaching more people in need. 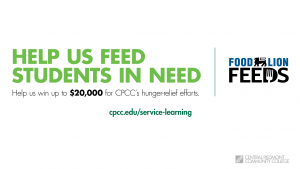 If you can’t make a monetary donation at this point, please consider bringing in a food donation to the Service-Learning Center at your campus! Our locations are listed on our website here. 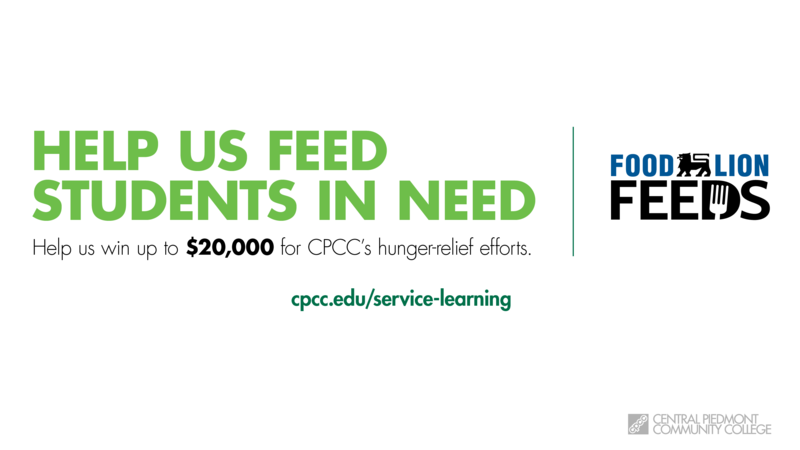 Please help us reach our goal and WIN this challenge to feed more CPCC family members by sharing this page on Facebook and Twitter! Or, even better, send an e-mail to friends you think might be interested in contributing and include a link to our page! Thanks so much for your generosity. Together we can END Hunger! Questions? Please contact Jenn.Marts@cpcc.edu or 704.330.6824. Did You Know That There Are Now Emergency Food Pantries at All Six Campuses? Did you know that there are now Emergency Food Pantries at all six campuses! The Emergency Food Pantry is able to provide individuals and households within the CPCC community with two days worth of non-perishable food per visit. The amount of food received depends on how many people live in the household. Individuals are eligible to visit the food pantry two times each month. Questions? Email or call Dena Shonts at ext. 6558. Single Stop Services Available at the Harper and Cato Campuses! Medicaid, Medicare, and more. Single Stop staff can connect you with community resources, tax preparation services, financial counseling, and legal services. 2. On the right-hand side under Student Services, you will see Single Stop Screener, click on it. 3. The screener will appear and you can get started! After you complete your screening a Single Stop benefits counselor will call you to further discuss how we can assist you. Did You Know that We Have Emergency Food Pantries on Campus? Service-Learning Department has partnered with a local non-profit, Loaves & Fishes to establish Emergency Food Pantries on four CPCC campuses. The Emergency Food Pantry is able to provide individuals and households within the CPCC community with 2 days worth of non-perishable food per visit. The amount of food received depends on how many people live in the household. Individuals are eligible to visit the food pantry 2 times each month. All you need is your CPCC ID. Currently, food pantries are located on the Central, Levine, Harris and Cato campuses. For information on days, hours, and locations please visit the Emergency Food Pantry Website.